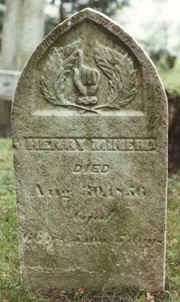 Henry Minerd was born on Christmas Day in 1790, in Somerset County, PA, the son of pioneers Jacob and Maria (Nein) Minerd Sr. His grave at the Hopwood Cemetery, shown here, is the second oldest known family marker in Western Pennsylvania. At last count, Henry and his wife had produced 15 children, 102 grandchildren and 341 great grandchildren, virtually all born before the year 1900. Some of those numbers may increase as more research is conducted. Henry's birthplace likely was on or near the 393-acre tract his parents settled on in 1791 -- at Maple Summit, along the mountainous border of Fayette-Somerset County, PA.
Henry married Hester Sisler, also a native of Somerset County. There is no record of the date of their marriage. Their first child was born in 1811, giving us a hint at the timeframe. The Minerds' 15 children were Daniel Minerd, James Minerd Sr., William Minerd, Samuel Minerd, Mary Ann Devan, Andrew Minerd, Jesse Minerd, Isaac Minerd, Mahala McKnight, John Vernon Smith Minerd, Mariah White, Sarah Jane Ingles Ogle, George Henry Minerd, Barbara McKnight and Arthur Minerd. Sadly, son Arthur died at a young age, but specific facts about his passing are lost to history. Most of the surviving children have descendants living today in Western Pennsylvania. Henry is believed to have lived on the family farm for many years. He apparently secured unskilled work when available in and near Connellsville and Dunbar, Fayette County, during the emerging years of the coal, coke and iron industries. In 1818, Henry's name was published in the Philadelphia Inquirer related to a list of taxable persons who owned property in Wharton Township, Fayette County. He himself was not considered "taxable" but his name appears in the entry for landowner George Frame, who had 418 acres, "on Stony springrun, adjoin'g Henry Minerd." The precise site of this tract is not yet known. The Fayette County tax assessment for the year ended Dec. 31, 1819, shows that Henry resided in Dunbar Township and worked as a laborer, probably in the emerging iron industry. The only property he owned was one head of cattle, but nothing more, and he was assessed accordingly. In 1820, at the birth of their son Samuel, they were in or near Connellsville, Fayette County. At the age of 30, Henry and Hester lived with his widowed mother on the old family farm when the federal census was taken in 1820. Later, when the farm was to be sold in 1826, his name appeared in a Philadelphia newspaper advertisement, on order of the Treasurer of Fayette County, for non-payment of taxes. Henry and Hester had few resources and many financial problems. County tax records of the 1830s show that several of their children were on lists of "Poor Children" whose family was unable to pay school taxes. He is thought to be the same "Henry Minor" who sued Christian Seneff in 1830 over a $20 dispute and in turn was sued by Seneff in 1841. He also appears to have sued Isaac Brownfield in 1839 in a dispute over Brownfield's refusal to pay $100 for "works, labours, services and moneys laid out." The court papers show that the family name was alternately spelled both Minard and Minor. In 1839 and 1840, they lived in Wharton Twp., and he worked as a laborer with his eldest sons, Daniel and James. In 1854, they were still in Wharton, and hosted the wedding of their daughter Barbara to Henry "Foxy" McKnight at their home. Henry died on Aug. 30, 1856, at age 66 years, eight months and five days. He is buried at Hopwood near his son James and son in law Perry G. White, among scores of his descendants who rest there today. Hester survived Henry by many years, though her final fate is unknown. In both 1860 and 1870, she headed a household containing her son George and divorced daughter Sarah Ingles. Grandsons George E. Ingles and William H. Ingles also resided with her in 1870. Henry is mentioned in a chapter about his father in Franklin Ellis' 1882 History of Fayette County. Henry and Hester both are mentioned in Wiley's 1889 Biographical and Portrait Cyclopedia of Fayette County in a chapter about their grandson Rev. David Ewing Minerd, the famed "Blacksmith Preacher" of Fayette County. Philadelphia Inquirer image courtesy of GenealogyBank.com.